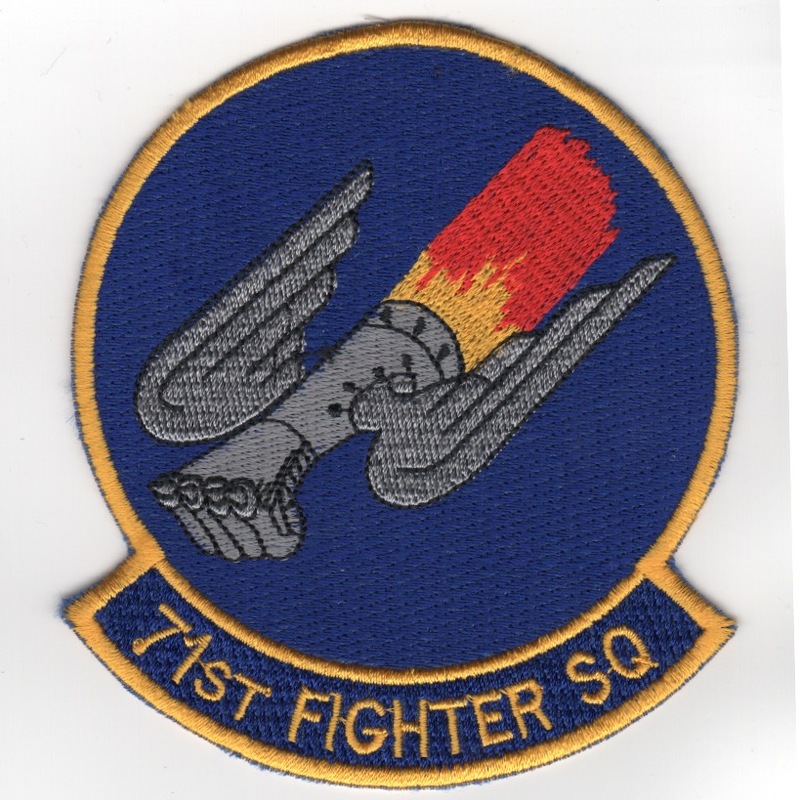 (Korean): The 71FS is a squadron of the USAF, and part of the 1st Operations Group of the 1st Fighter Wing. The 71st is stationed at Langley Air Force Base, VA. The squadron was equipped with the Northrop T-38, and was also the last squadron of the 1FW to fly the McDonnell Douglas F-15C Eagle, with the 27th and 94th now flying the Lockheed Martin F-22 Raptor. The squadron is known as "The Ironmen" and depicts the "Gray Fist" with wings on a blue background. This patch was found in a Korean embroidery shop in very limited quantities and does not come with velcro attached. (Korean): The 90FS is a squadron of the USAF assigned to the 3d Operations Group, 3d Wing, Joint Base Elmendorf-Richardson, Alaska, Pacific Air Forces (currently). The squadron is now equipped with the F-22 Raptor. The 90FS is one of the oldest units in the USAF, first being organized as the 90th Aero Squadron on 20 August 1917 at Kelly Field, TX. The squadron deployed to France and fought on the Western Front during World War I as a Corps observation squadron. During World War II, the unit earned the Distinguished Unit Citation and the Presidential Unit Citation for its services in the Pacific Theater of Operations (PTO) as part of Fifth Air Force. During the Cold War the squadron fought in the Korean War and Vietnam War. 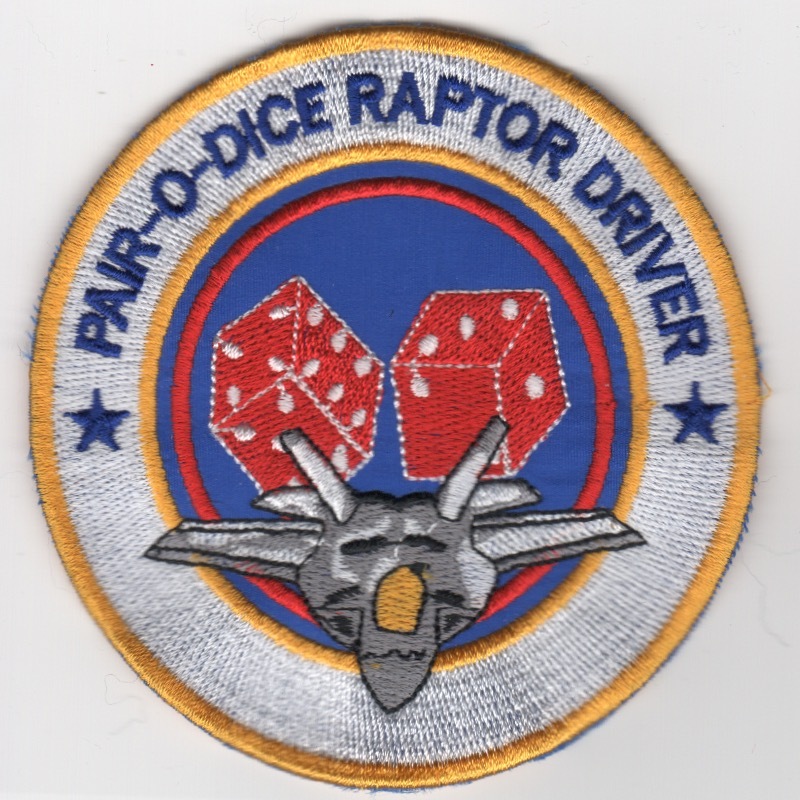 This patch shows the 'Raptor' with a "Pair of Dice", and says "PAIR-O-DICE RAPTOR DRIVER. It was found in a Korean embroidery shop in very limited quantities and does not come with velcro attached. (Korean): The 90FS is a squadron of the USAF assigned to the 3d Operations Group, 3d Wing, Joint Base Elmendorf-Richardson, Alaska, Pacific Air Forces (currently). The squadron is now equipped with the F-22 Raptor. The 90FS is one of the oldest units in the USAF, first being organized as the 90th Aero Squadron on 20 August 1917 at Kelly Field, TX. The squadron deployed to France and fought on the Western Front during World War I as a Corps observation squadron. During World War II, the unit earned the Distinguished Unit Citation and the Presidential Unit Citation for its services in the Pacific Theater of Operations (PTO) as part of Fifth Air Force. During the Cold War the squadron fought in the Korean War and Vietnam War. 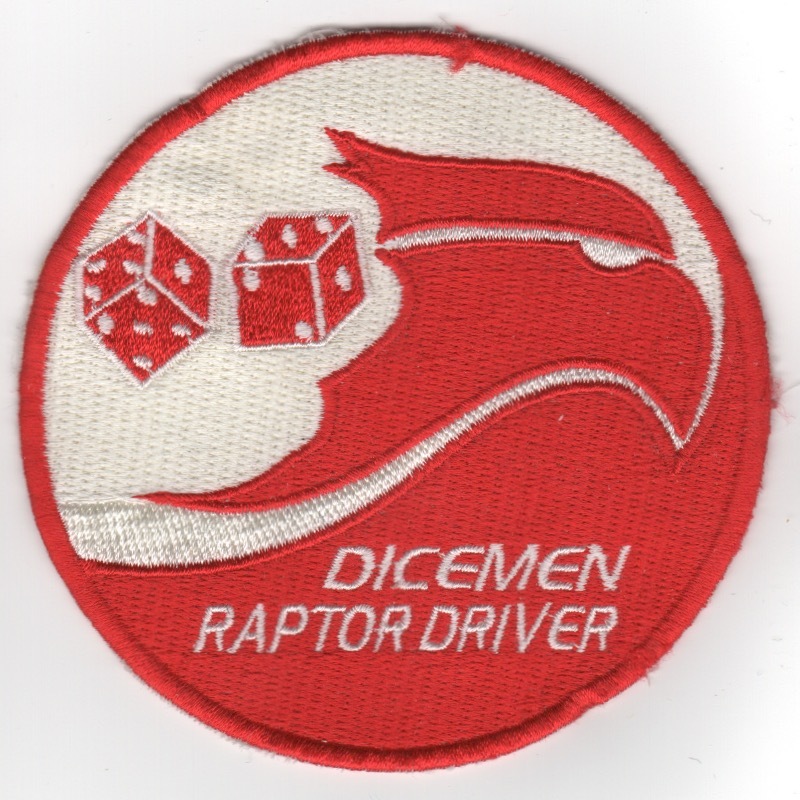 This is the red/white version of the standard F-22 Aircraft patch and says "DICEMEN RAPTOR DRIVER". It was found in a Korean embroidery shop in very limited quantities and does not come with velcro attached. (Korean): The 90FS is a squadron of the USAF assigned to the 3d Operations Group, 3d Wing, Joint Base Elmendorf-Richardson, Alaska, Pacific Air Forces (currently). The squadron is now equipped with the F-22 Raptor. The 90FS is one of the oldest units in the USAF, first being organized as the 90th Aero Squadron on 20 August 1917 at Kelly Field, TX. The squadron deployed to France and fought on the Western Front during World War I as a Corps observation squadron. During World War II, the unit earned the Distinguished Unit Citation and the Presidential Unit Citation for its services in the Pacific Theater of Operations (PTO) as part of Fifth Air Force. During the Cold War the squadron fought in the Korean War and Vietnam War. 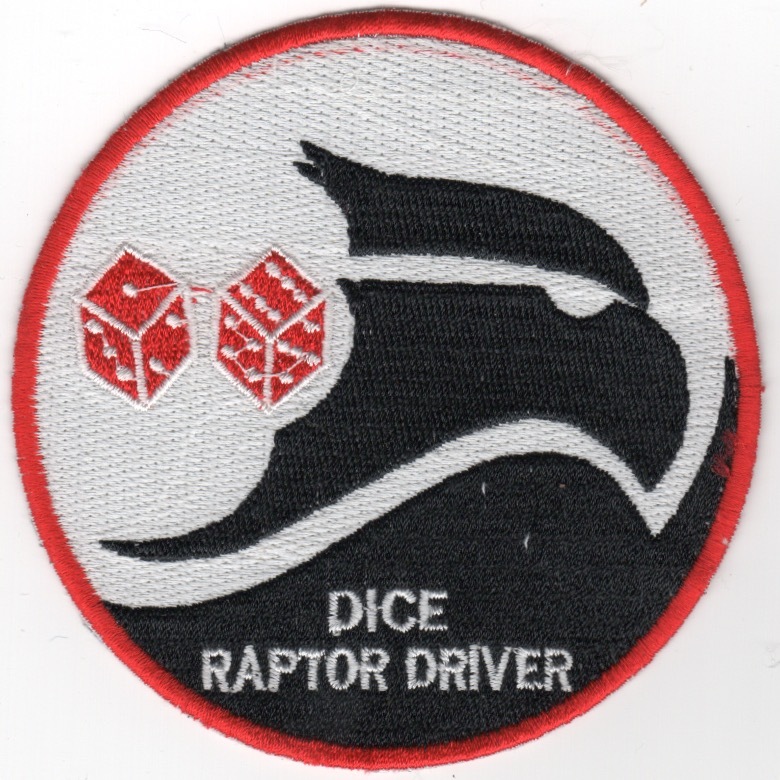 This is the black/white version of the standard F-22 Aircraft patch and says "DICE RAPTOR DRIVER". It was found in a Korean embroidery shop in very limited quantities and does not come with velcro attached. (Korean): The 90FS is a squadron of the USAF assigned to the 3d Operations Group, 3d Wing, Joint Base Elmendorf-Richardson, Alaska, Pacific Air Forces (currently). The squadron is now equipped with the F-22 Raptor. The 90FS is one of the oldest units in the USAF, first being organized as the 90th Aero Squadron on 20 August 1917 at Kelly Field, TX. The squadron deployed to France and fought on the Western Front during World War I as a Corps observation squadron. During World War II, the unit earned the Distinguished Unit Citation and the Presidential Unit Citation for its services in the Pacific Theater of Operations (PTO) as part of Fifth Air Force. During the Cold War the squadron fought in the Korean War and Vietnam War. 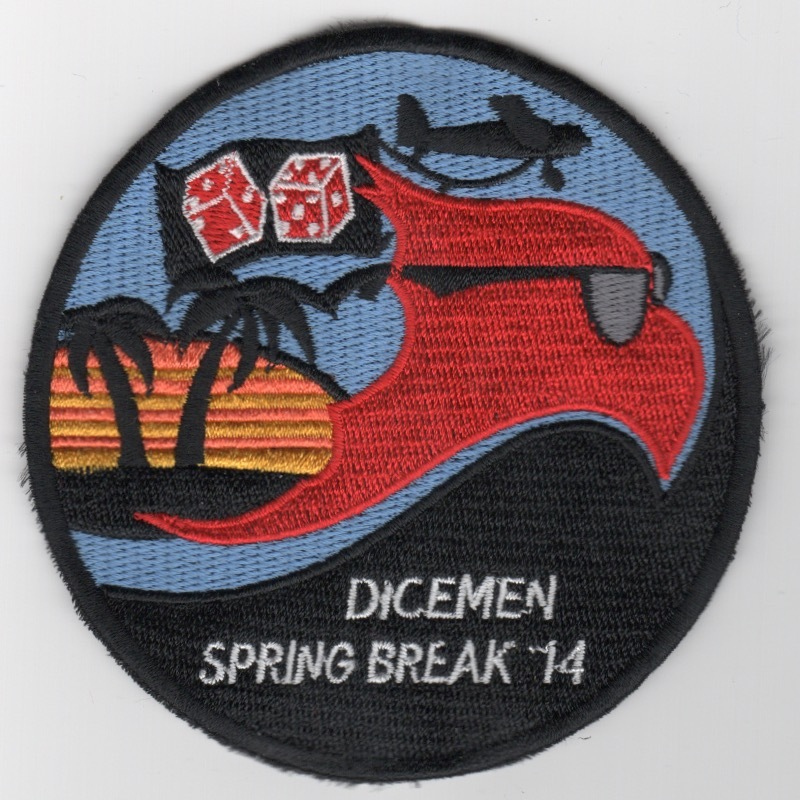 This is the '2014 SPRING BREAK' patch created for them....not sure of the story behind it. It was found in a Korean embroidery shop in very limited quantities and does not come with velcro attached. In Stock: ONLY TWO!!! (Email me to Order)!! (Korean): The 94FS is a unit of the USAF 1st Operations Group located at Joint Base Langley�Eustis, VA. The 94FS is currently equipped with the F-22 Raptor and is one of the oldest units in the USAF, first being organized on 20 August 1917 as the 94th Aero Squadron of the United States Army Air Service at Kelly Field, TX. It was one of the first USAF operational squadrons equipped with the F-15A Eagle in January 1976. With the disestablishment of TAC in 1992, it was assigned to the newly-established Air Combat Command (ACC). This is the standard squadron patch worn by the unit. It was found in a Korean embroidery shop in VERY limited quantities and does not come with velcro attached. While the "normal" squadron patch is readily available on other sites, this one was made in the Pacific Theater and has that "feel" about it. Since I only have TWO, you have to email me to order it!! In Stock: ONLY THREE!!! (Email me to Order)!! (Korean): The 94FS is a unit of the USAF 1st Operations Group located at Joint Base Langley�Eustis, VA. The 94FS is currently equipped with the F-22 Raptor and is one of the oldest units in the USAF, first being organized on 20 August 1917 as the 94th Aero Squadron of the United States Army Air Service at Kelly Field, TX. It was one of the first USAF operational squadrons equipped with the F-15A Eagle in January 1976. With the disestablishment of TAC in 1992, it was assigned to the newly-established Air Combat Command (ACC). 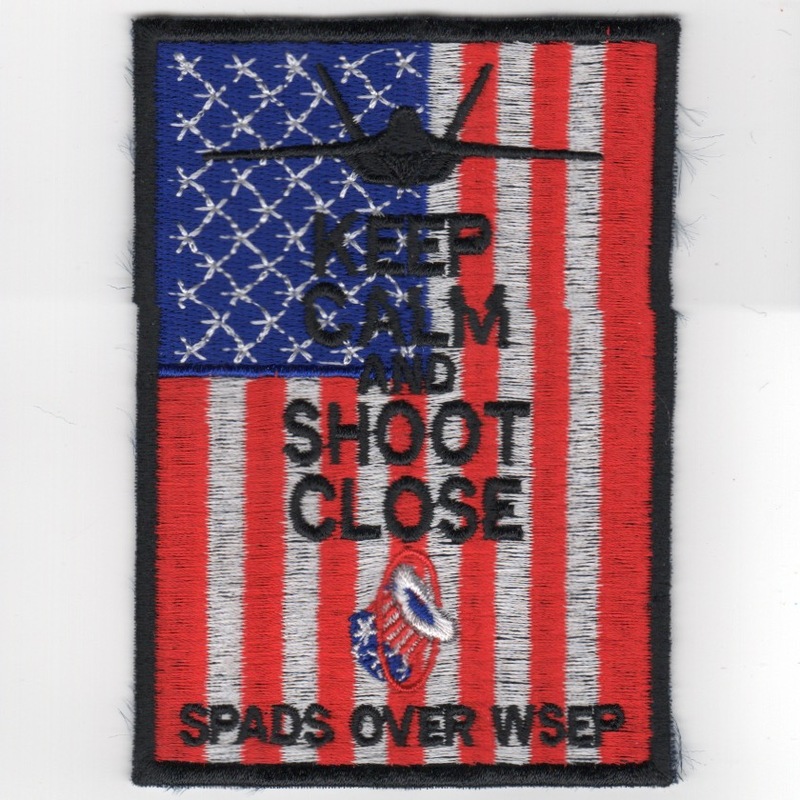 This is the 'KEEP CALM and SHOOT CLOSE' patch worn by the unit when they attended USAF Weapons School support exercise. It was found in a Korean embroidery shop in VERY limited quantities, has that "theater-made" feel about it, and does not come with velcro attached. Since I only have THREE, you have to email me to order it!! 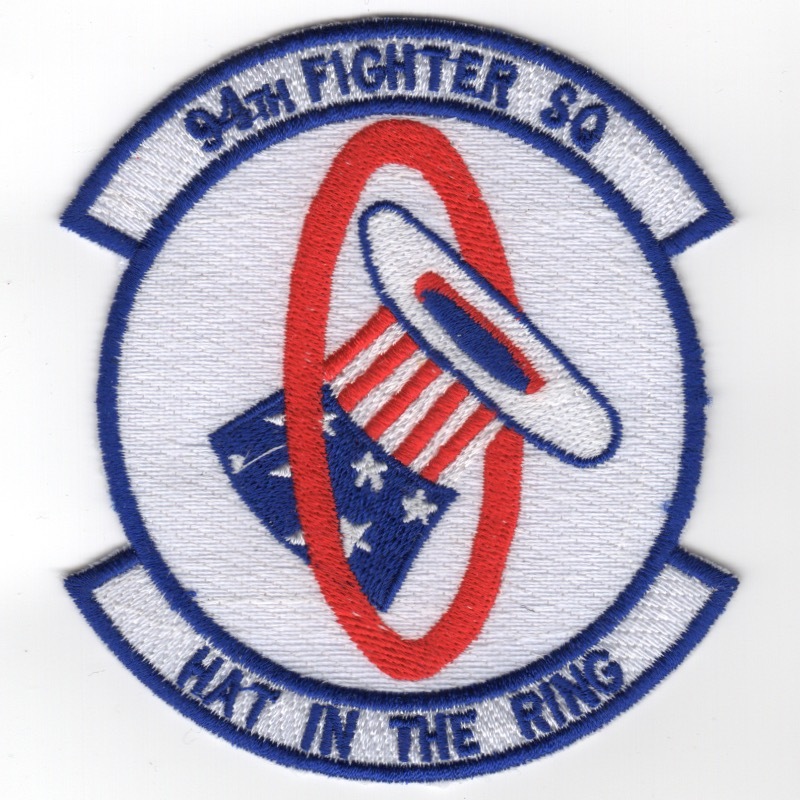 (Korean): The 94FS is a unit of the USAF 1st Operations Group located at Joint Base Langley�Eustis, VA. The 94FS is currently equipped with the F-22 Raptor and is one of the oldest units in the USAF, first being organized on 20 August 1917 as the 94th Aero Squadron of the United States Army Air Service at Kelly Field, TX. It was one of the first USAF operational squadrons equipped with the F-15A Eagle in January 1976. With the disestablishment of TAC in 1992, it was assigned to the newly-established Air Combat Command (ACC). 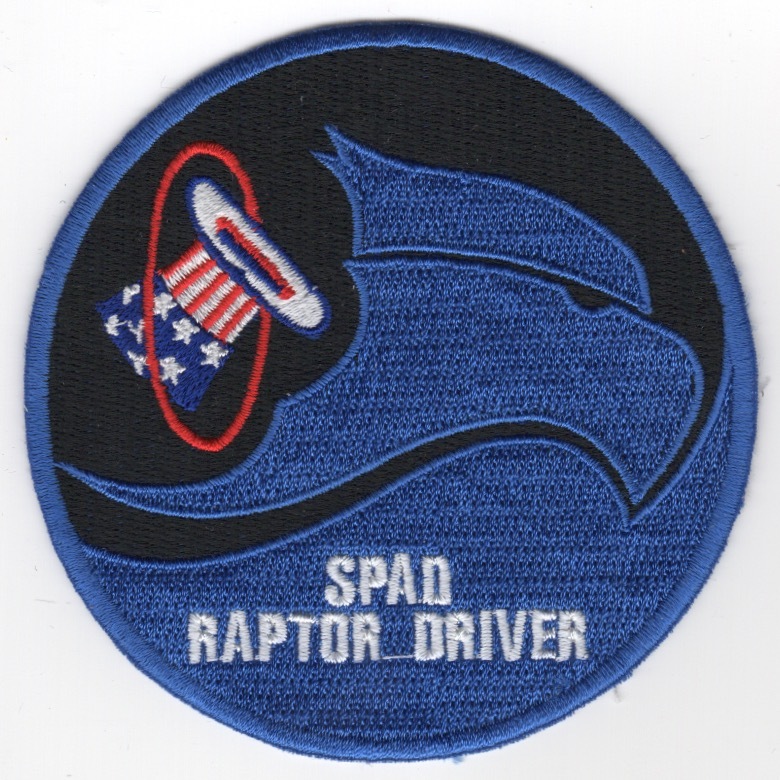 This is the standard F-22 patch and says "SPAD RAPTOR DRIVER" on it. It was found in a Korean embroidery shop in VERY limited quantities, has that "theater-made" feel about it, and does not come with velcro attached. Since I only have THREE, you have to email me to order it!! (Korean): The 94FS is a unit of the USAF 1st Operations Group located at Joint Base Langley�Eustis, VA. The 94FS is currently equipped with the F-22 Raptor and is one of the oldest units in the USAF, first being organized on 20 August 1917 as the 94th Aero Squadron of the United States Army Air Service at Kelly Field, TX. It was one of the first USAF operational squadrons equipped with the F-15A Eagle in January 1976. With the disestablishment of TAC in 1992, it was assigned to the newly-established Air Combat Command (ACC). 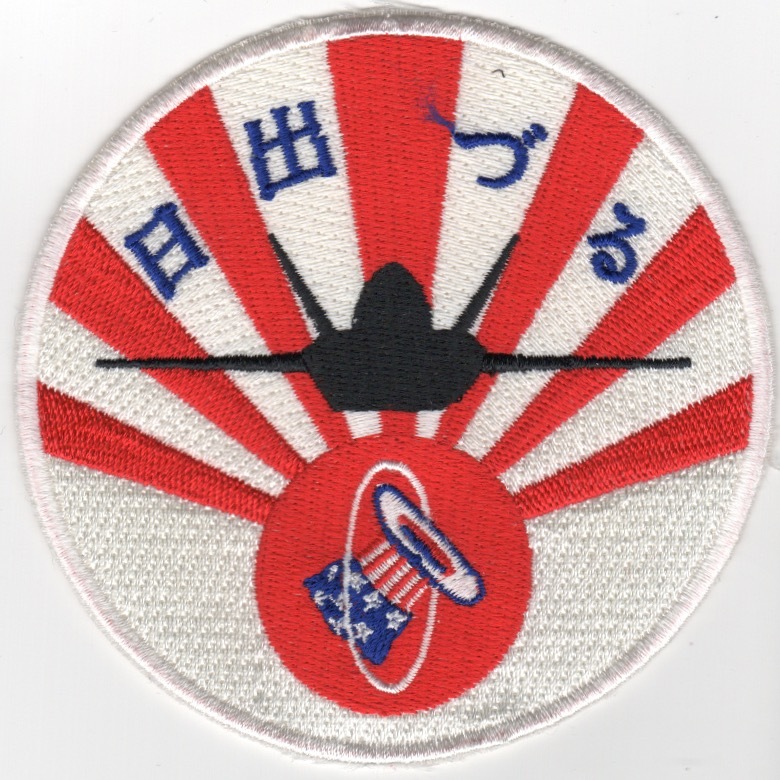 This is the version of the Raptor patch that shows the Front-View of the Raptor on the Red-White Sun Rays (standard for Pacific Theater). It was found in a Korean embroidery shop in limited quantities, has that "theater-made" feel about it, and does not come with velcro attached.